Structural changes across the world are raising questions for economic development, and for the future forms of jobs and employment. FES Thailand has been part of the Thai Civic Education network since the latter was founded in 2011. 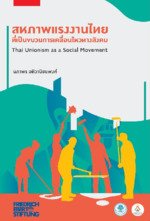 Across Thailand, many vibrant communities of feminist activists, reformers and educators are active across a range of fields. Together with its partners, FES engages with policy communities through its Economy of Tomorrow programme. To learn more about FES Thailand and our most recent activities follow us and like our Facebook Page.